Top: Immunofluorescent image of a human Fibroblast cell over-expressing USP30-Flag. USP30 localized to mitochondria, but could also be seen in small punctate structures that co-localized with peroxisomal proteins (yellow puncta in merge image). Bottom: USP30 dual localizes to mitochondria and peroxisomes, where it opposes the action of Parkin and PEX2 respectively, resulting in decreased overall organelle ubiquitination. The regulation of organelle abundance is critical for cell function and survival; however, the mechanisms responsible are not fully understood. Imbalances in organelle abundance can result in disease states, including Parkinson’s Disease resulting from dysregulated mitochondrial homeostasis. Peroxisome dysregulation also results in disease, most notably the Zellweger’s spectrum disorders. Although first considered to be caused exclusively by reduced peroxisome biogenesis, recently work shows that the most are due to increase degradation of peroxisomes by pexophagy. In a paper recently published in the Journal of Cell Biology, from the Kim and McQuibban Labs, Riccio et al describe a novel role of the mitochondrial deubiquitinase USP30 in peroxisome homeostasis. The activation of mitophagy (the autophagic degradation of mitochondria), and pexophagy required the ubiquitination of their membrane proteins by Parkin and PEX3 respectively. The Kim and McQuibban lab previously demonstrated that the deubiquitinating enzyme USP30 opposes the action of Parkin to prevent mitophagy. Now they also find that USP30 regulates pexophagy. Finding that USP30 also localizes to the peroxisome, they then characterized its role in pexophagy, finding that depletion of USP30 resulted in increased basal peroxisome loss in an autophagy dependent manner. 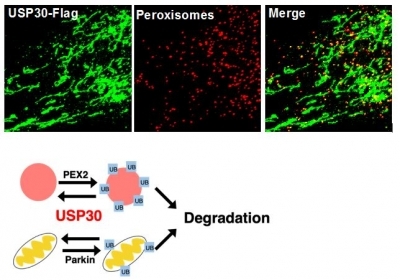 They found that USP30 over-expression resulted in less ubiquitinated peroxisomes while depletion resulted in ubiquitination of at least 2 peroxisome membrane proteins. Finally, they over-expressed USP30 in a patient fibroblast cell line expressing the most common PBD mutation. The over-expression of USP30 was found to double peroxisome numbers in these cells, suggesting a potential therapeutic approach in the treatment of PBDs.